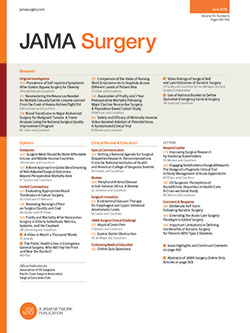 To the Editor Healy and colleagues1 published a thoughtful analysis on the hospital and payer economics of surgical complications for 5120 patients treated at a university health system during the period from 2008 to 2015. Their analysis demonstrates a decrease in total margin from 5.8% to 0.1% for patients with surgical complications. The figures and tables focus exclusively on total margin. Contribution margin was not detailed except to report that “contribution margin (reimbursement less variable costs only) was found to decrease with complications overall, from 58.8% without complications to 56.6% with complications.”1 We suspect that by focusing all of the figures and tables on total margin and reporting contribution margin only on a percentage basis, hospitals’ financial incentives were not fully elucidated for readers.